This appetizer recipe is a long time favorite. I actually forgot all about it until I was looking through my beloved recipe binder. I discovered this recipe when we were living in Canada. Canada has a great magazine called Canadian Living and I always found really good recipes in it. I miss that magazine come to think of it. 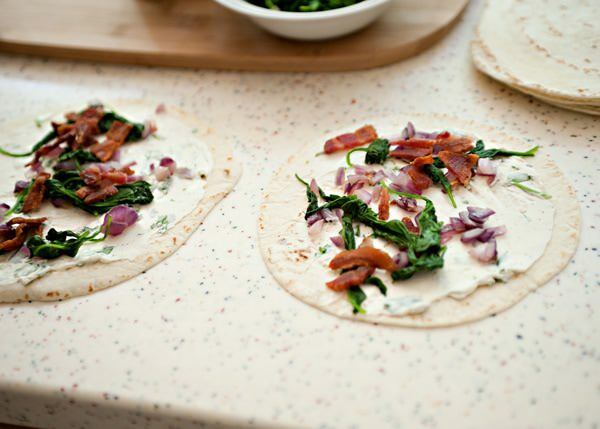 This Spinach and Bacon Roll Up recipe is my favorite kind of recipe. It can be made up to a month ahead of time and kept in the freezer. You can broil them from frozen any time that you would like. I made these for a Christmas Eve Open House years ago and the next day I had numerous requests for this recipe. This easy appetizer recipe is a keeper and I so happy that it is back in my rotation. Take this recipe and use it as a springboard. You could make a Mexican version with maybe cheddar and tomatoes. Or maybe a Greek one with feta and olives and peppers. Really, you could use this technique and make a million different versions. In a small bowl, combine the cream cheese, jalapeno, cilantro, salt and pepper. In a saute pan, cook the red onion in the olive oil until soft. Take the onions out of the pan and set aside. Add the spinach and cook until wilted. Drain out the water. Set that aside also. 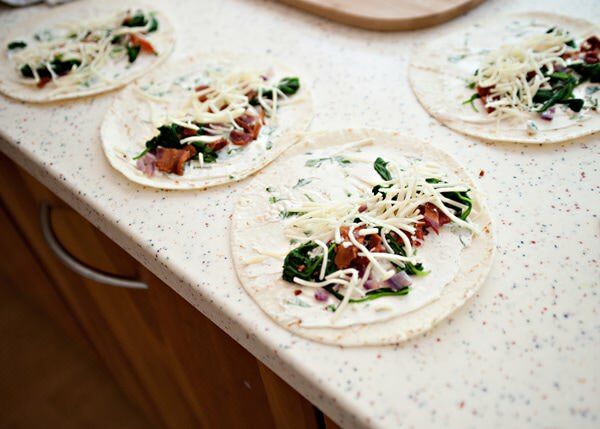 Spread the cream cheese on a tortilla. I set up an assembly line and laid out all 10 tortillas. 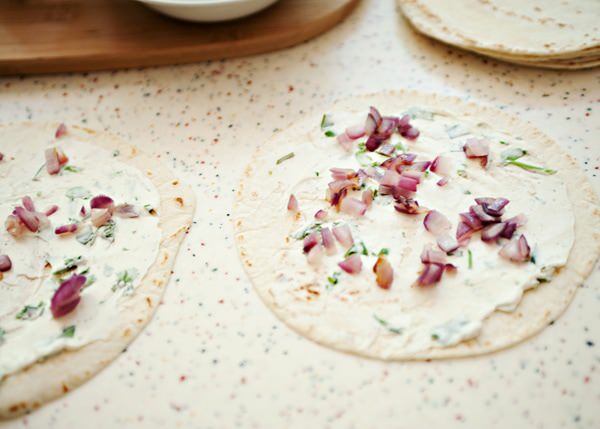 Sprinkle the red onions on the tortillas. 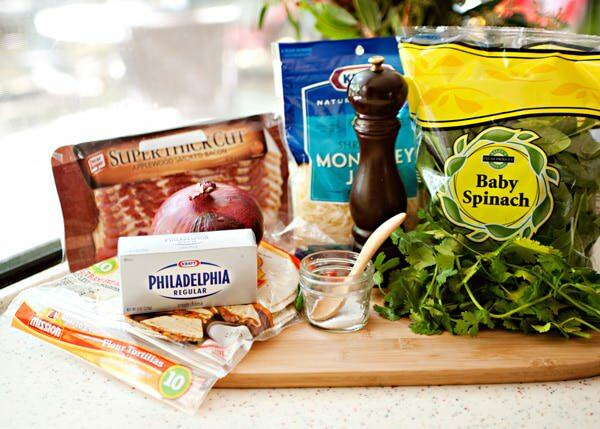 Add the spinach and bacon. 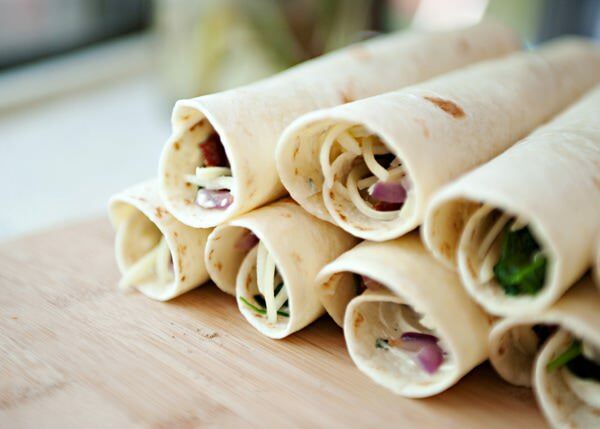 Roll the tortillas up. Put them in the fridge for an hour to firm up before you cut them. 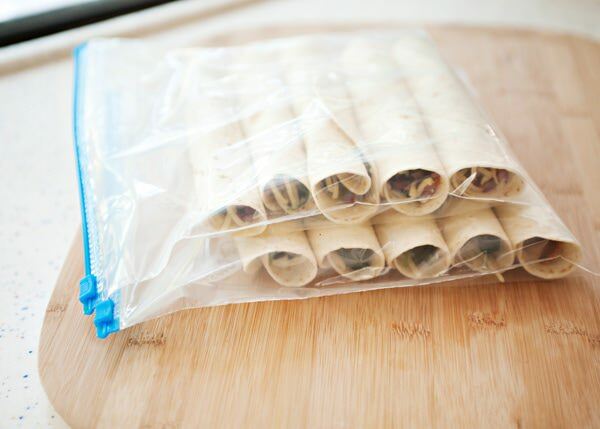 If you are going to freeze them, I would wrap them in waxed paper and then put them in a freezer bag. I kept these in the fridge and used them the next day so I did not wrap them in paper, just a Ziploc bag. When you are ready to cook them off, trim the ends off of the tortillas and cut them into 6 slices. Make your clean up a little easier than I did and line the pan with tin foil. Put the tortillas under the broiler for about 3 minutes, or until the cheese is melted and golden brown. These little babies are addictive. You have been warned. Yum, I love these little appetizers too. Unfortunately, the people who made them never thought to put bacon in it like you did. Why not? Bacon makes everything better. Bacon should be a food group. Oh yum. I think this will be my lunch today! I ate them for lunch the day that I made them too. 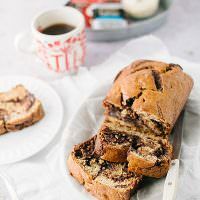 I had these once at a party and I really enjoyed them so I’m glad you posted this recipe! They look so simple and easy to make ahead of time. Love it! Looks great, can’t wait to try making these! 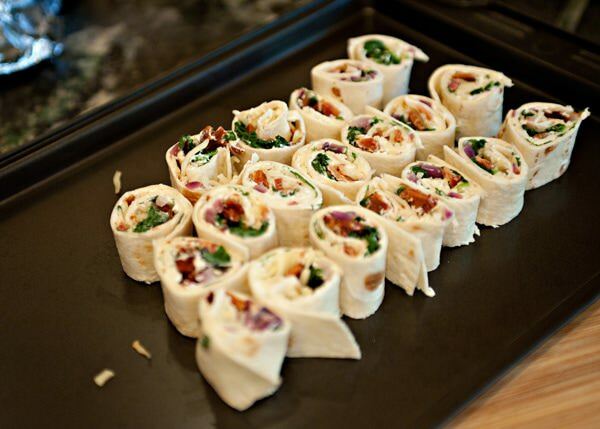 They are perfect to make ahead of time. You can keep them in your freezer and just cut them as you need them. Those remind me of the awesome pickle roll-ups I made several summers ago.. Basically, just pick your meat (I had pastrami), slather on cream cheese, and put a dill pickle spear, and roll it up. Ta-da, instant appeitizer! 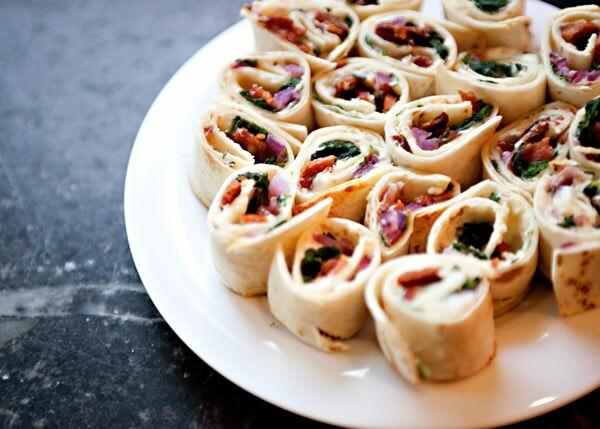 These look like the perfect party appetizer. I just bookmarked this recipe. Thanks for sharing. I’ve seen these rolls a lot, but never hot. Those look awesome. I have everything in my fridge to make them too. I’m going to have to try these! thanks… I love these and I also usually have everything in my fridge to make them when I feel like a treat. These Roll Ups look delicious! yum! if you are heating up a frozen batch, how much longer will they need to stay under the broiler? maybe a minute or so… not very long. I am sorry if my print-friendly is not working, I’ll check it right now. This is certainly a springboard recipe! I was just thinking how this would also be great with hummus instead of cream cheese. 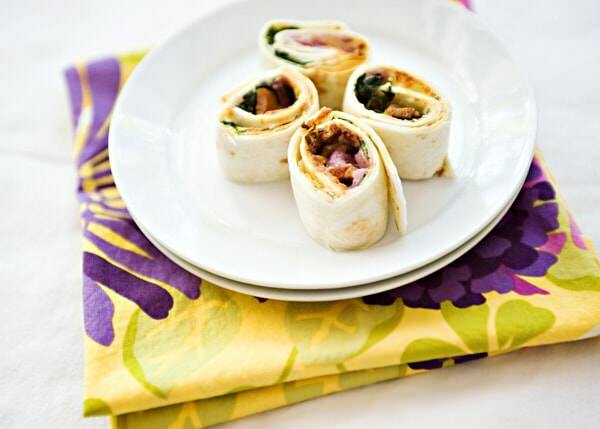 Love that you’re using spinach; healthy and delicious! Looks delish! I agree bacon makes everything better! These were simply delicious! Made them for Halloween get together and they were a big hit! Thanks so much for sharing the recipe. I am so glad. You are welcome. Sounds yummy, I think I’ll have to make these for my next get together. By the way, Canadian Living does email newsletters now as well as the magazine one of which is just for recipes. Plus they have a pretty good online archive for old recipes as well. I go on their website every now and again, I loved that magazine. I ate the leftovers for breakfast, after a second run through the broiler! YUM! Thanks for this recipe. The measurements were perfect for flavor. I needed a simple pinwheel for an event, but wanted to work with what I had on hand. Your blend nailed. it! Did I mention leftovers? I’m talking about 10 out of the 60 I made! 😀 big hit! Thank you! Glad that you liked them. These are one of my favorite recipes. was wondering if i took these to a tailgate if they could be heated on the grill in a skillet? Sure thing. Sounds like a good thing to take to a tailgate! Thanks Dani! It freezes really well too. These are awesome! Will definitely be making them again. Aren’t they? 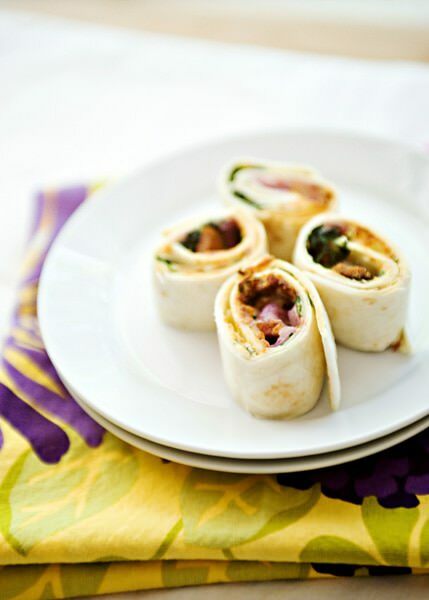 I love how easy this appetizer is to make too. 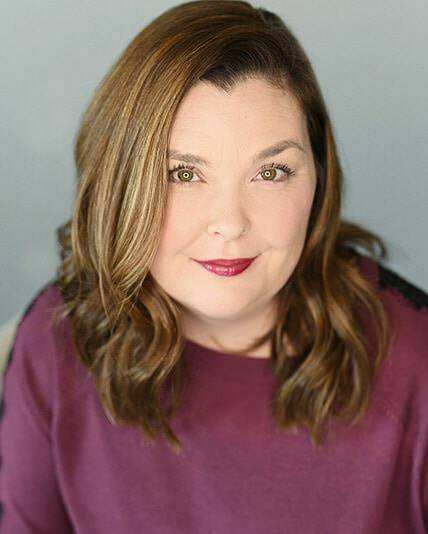 Bree you are woman after my heart and it seems that I have someone just like me I love to cook I love to please others through their tummies and I give out my recipes. You rock! Many cooks have the audacity to say I do not give out my recipes or it’s a family secret. My response to anyone who tells me this “so you plan to take that delicious recipe to your grave where no one else to be able to make. Makes absolutely no sense. I always give out my recipes or tips on how I make my food taste so good. Not to mention no one can do it the same way that we do it. For those of you who are great cooks you know if you give someone everything that you use to make a dish I promise your most people cannot and will not be able put it down in the kitchen the way you do. I am excited and I am making these tonight. Decided to research spinach roll ups because my sister n law was making some and said that people love them. Did not get her recipe asked her what she did but was not really specific just said she took creme cheese and put spinach inside and then roll them up did not sound like enough info. Needless to say found yours and it sounds so good going to do it your way this time but taking your advice and playing with this recipe and doing it different ways.